President Donald Trump has said the Uzbek attacker who killed people Tuesday night in Manhattan came to the United States on a diversity immigrant visa. In the wake of the attack, Trump says he wants to work with Congress immediately to end the diversity lottery program. “I am today starting the process of terminating the Diversity Lottery Program. I am going to ask Congress to immediately initiate work to get rid of this program—diversity. Diversity Lottery. Sounds nice, it’s not nice. It’s not good. It’s not good. It hasn’t been good. We’ve been against it,” Trump said. For would-be Americans who don’t have family in the U.S., or an employer to sponsor them, or who aren’t refugees, the diversity visa, also known as the green card lottery, is the only option. It requires a high school degree or a few years of work experience just to qualify. The State Department noted, however, that visa information is confidential under U.S. law, and that they could not comment on any specific visa application. Senate minority leader Chuck Schumer played an important role in drawing up legislation for the program in the 1990s. In a statement released Tuesday, he said "I have always believed and continue to believe that immigration is good for America," proposing that Trump focus on the "real solution" of anti-terrorism funding, which would be cut under the most recent budget proposed by the administration. 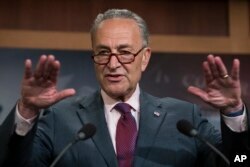 Though Trump attributed the visa lottery program to Schumer, the Senate minority leader was actually one of the "Gang of 8" bipartisan lawmakers who, in 2013, wrote the Comprehensive Immigration Reform bill which would have cut the green card lottery altogether. The bill passed the Senate but was not voted on by the house and since expired. FILE - Senate Minority Leader Chuck Schumer of New York speaks to reporters on Capitol Hill in Washington, July 28, 2017, after the Republican-controlled Senate proved unable to repeal and replace the Affordable Care Act. Leon Fresco, the former deputy assistant attorney general for the Office of Immigration Litigation at the U.S Department of Justice Civil Division during the Obama administration, drafted the legislation in 2013. "We did end the diversity lottery, though we replaced it with a work visa (merit immigration) that would allow you still to come but you’d have to earn your green card over time by making various contributions to the country," he told VOA in an earlier interview, specifying that cutting the program was part of a compromise between parties. Recently, the U.S. State Department announced that all entries to the lottery between October 3 and 10 had been lost and must be resubmitted. Earlier this year, republican senators proposed scrapping the program altogether. If the application to the Green Card lottery is valid, your number is chosen and you pass the other requirements for immigrants, you still need the money to get to the U.S. It's a small portion of immigration to the U.S. every year, but larger than other cornerstones of the program, like employment-based immigrant visas. In Fiscal Year 2016, the U.S. issued 45,664 diversity visas, of which 2,366 were from Uzbekistan. Natives of all countries qualify except Bangladesh, Brazil, Canada, China (mainland-born), Colombia, the Dominican Republic, El Salvador, Haiti, India, Jamaica, Mexico, Nigeria, Pakistan, Peru, the Philippines, South Korea, the United Kingdom (except Northern Ireland) and its dependent territories, and Vietnam. People born in Hong Kong, Macau, and Taiwan are eligible.